Malahide Cricket Club Dublin Ireland Game came to a natural conclusion? Or did it begin to rain? Or did it become too dark? Patrick Comerford has the answer – he posted this beautiful picture on Facebook. Thrilling finish down Boylston Street. Wasn’t that a beautiful run. I viewed it on my computer and was almost jumping out of my seat and cheering as she ran the final yards. I had tuned in just at the point when she was appearing in the background far to the left of the 2 leading women. She just kept closing and finally overtaking them and powering on to the finish. An elegant run. 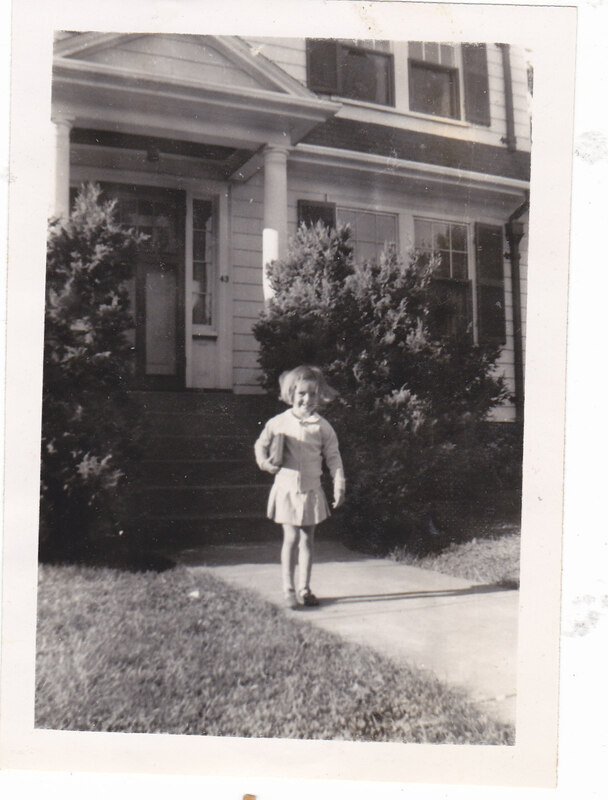 This is the first day of school here in Seattle so just for fun I have found a picture of my first day of school back in 1941.
first day of school, 1941 – that’s me age 4 1/2 all set for my first day of kindergarten at Payson Park School, just down the hill in Belmont Massachusetts. My teacher was Miss Fitten. The other kindergarten teacher was Miss Hurd. I was the fourth of the Miller children to attend. And Miss Hurd was the principal. All the teachers were Miss. The grades went K-6 and 2 classes in each grade. The school closed sometime in the 1970’s and subsequently burned to the ground. 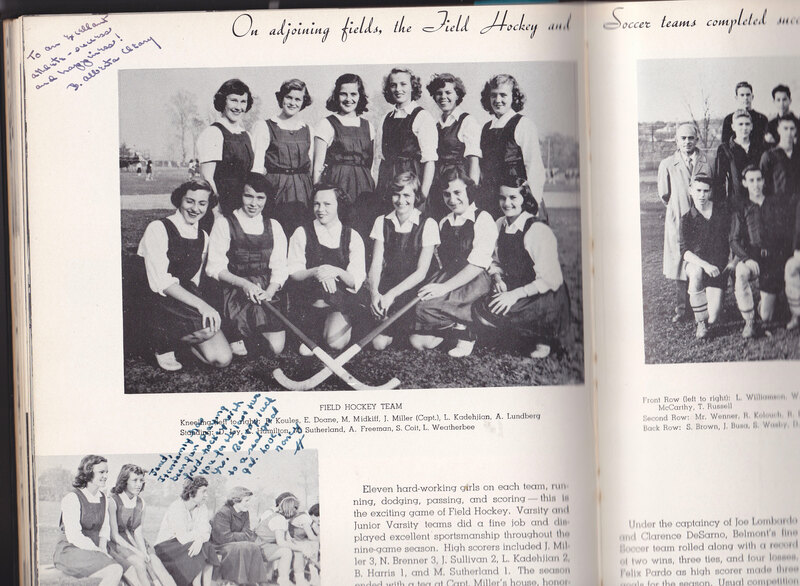 Now I will fast forward, and since it is supposed to be autumn, and that meant field hockey season, I will show a picture from my Belmont High School yearbook, 1954. How I happen to have that yearbook is another story which I don’t think I have related yet on the blog. That tale will wait for another time. I was very keen on field hockey and am still in touch with some of the teammates pictured above. Anne Freeman Mayo, now living in Wethersfield Connecticut near our son David; Sandy Coit Steven, living in the far north of British Columbia in Vanderhoof; Susan Bliss Alden living in Burlington Vermont. Ashley’s grandma (me) tried to teach Ashley to knit on a Knitting Nancy or a Knitting Spool – I should have practiced first! Didn’t do very well but I have found several sites showing the process and plan to follow up on this to our mutual satisfaction. Problem is Ashley is 6000 miles away. Sad sad. Never mind, we’ll work it out. Trying to do French knitting (another term for the Knitting Nancy) was only 1 of my knitting activities while I was away. 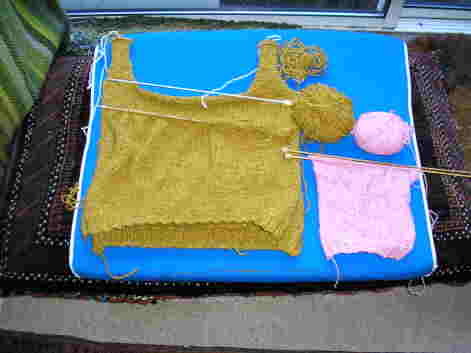 I also worked a little bit on the pink baby thing and on the yellow tank top. No progress to report on the Eccentric Blanket. The rest of my knitting time consisted of visiting yarn stores and buying knitting and weaving books. I’ll put in a plug here for Woolcott in Harvard Square in Cambridge (Massachusetts), Village Wool in Glastonbury Connecticut, and of course the famous Weaving Works in Seattle. Now you know where I’ve been. Add the Von Huene Workshop (The Early Music Shop of New England) in Boston where I met a cyclist proudly wearing the bright red Paris-Brest-Paris T-shirt – she did the 1200 K challenge on a fixed gear bicycle which made it even more of a challenge compared with the fancier titanium bicycles costing thousands of dollars. For those of you interested in reading more about the PBP you can read Emily’s blog at this link. And the list of bookshops visited would also add to the count – I added Elizabeth Zimmermann’s Knitting Without Tears to my collection plus a couple of weaving books. Also Priscilla A. Gibson-Robert’s Knitting in the Old Way and Meg Swansen’s Handknitting. My case got very heavy.